The smart city, above all else, is optimized with infrastructure to service its constituents — the people who live and work in that city. Transportation plays a key role in that equation, more so now that technology providing real-time vehicle updates is becoming widely available. Smart transit boils down to being able to solve problems. Tripshot is headquartered in the Bay Area, and the smart transit problems our community encounters are common to public agencies and major private companies — riders want to know their options for traveling, and they want that information in real time. Tripshot features a trip planner for riders, a route manager for operators and intelligent alerts. The Bay Area features very long routes, sometimes exceeding one to two hours in length. These routes are fraught with traffic and accidents that cause significant delays. Riders just want to know if they are going to be picked up on time. Perhaps a rider only has two public transit buses available before he or she needs to be at work. If they don’t catch either of those buses, they will need to take an Uber or a Lyft which can result in charges exceeding $100. In situations like this, a rider needs to know exactly where the vehicle is and the delays it is experiencing. The best solution, given the distribution of technology today, is a mobile app. Generally, transportation has seen a lack of high-quality, affordable, real-time vehicle tracking solutions. Many popular systems tend to be cobbled together from multiple solutions — one piece of software doing scheduling, another tracking GPS and another determining estimated times of arrival (ETAs). Riders need a working app that lets them know when their vehicles are coming, allowing them to optimize their time and remain productive. Given riders’ access to technology, the time has come for agencies of all sizes to make sure they have a good trip planning and passenger information distribution system. 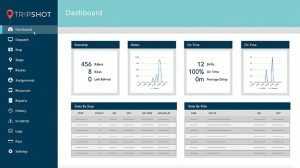 Tripshot is an all-in-one transportation fleet management software. 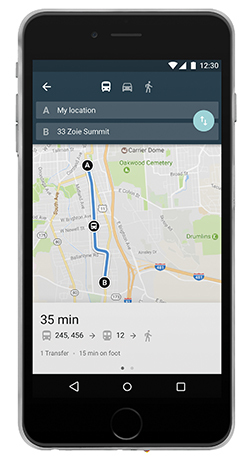 Intelligent alerts support a trip planner for riders as well as a route manager for operators (with stop-by-stop and route history reporting). In addition to badging, manual passenger counting and vehicle capacity reporting in real-time, it is capable of providing fare-based ticketing, ride-sharing organization and data logging for electronic logging devices (ELD). It is a modern web-based platform for all aspects of fixed-route and on-demand transportation services. Riders can see not only bus schedules, but they can hail on-demand requests for smaller vehicles owned by the transit agency (not a public TNC). Solutions like it are perfect for first and last mile microtransit services that are aimed at supplementing fixed-route services. Important to the smart city concept, Tripshot offers true real-time ETAs that factor in traffic and the current location of the vehicles. ETAs aren’t based off historical data, static time tables, or homegrown algorithms — it uses actual traffic flow data to guarantee accuracy. I have spoken with many providers who previously worked with products “guaranteeing” a list of services never delivered upon. If this is an important solution to optimizing your services, do some research and try it out. Don’t let your riders get stuck with technology they are not happy to use. Free pilot programs are essential for agencies looking to make such a big upgrade. The team at Tripshot spends a lot of time developing a turnkey rider-facing app but also working with actual transit operations teams to build out solutions that help their services. We offer features including dispatch, digital pre- and post-trip check lists (driver vehicle inspection reports), maintenance and incident tracking, driver fatigue monitoring and robust reports. Solutions like this can fulfill multiple unique functions, resulting in an optimal rider experience and user-friendliness. Agencies do not want five different applications for fleet management — just one that works really well. It allows them to focus on the smart city and connecting as many people as possible with efficient transportation solutions. Patrick Le is COO and co-founder of Tripshot. Visit www.tripshot.com for more information.